DENALI FULLY LOADED! EXCELLENT CONDITION! GREAT DEAL! PREFERRED EQUIPMENT PACKAGE,SAFETY PACKAGE,NAVIGATION SYSTEM,LEATHER SEATS,SUN/MOONROOF,REARVIEW CAMERA,COLLISION ALERT,LANE DEPARTURE ASSIST,PARK ASSIST,PIONEER PREMIUM SOUND SYSTEM,BACK-UP CAMERA,LEATHER STEERING WHEEL WITH MOUNTED CONTROLS,VOICE RECOGNITION,BLIND SPOT MONITORING,REAR PARKING AID,KEYLESS ENTRY,REMOTE ENGINE START,POWER SEATS WITH ADJUSTABLE LUMBAR,HEATED SEATS,POWER LIFTGATE,EXHAUST DUAL WITH PREMIUM TIPS,COLOR 7 DIAGONAL TOUCH-SCREEN DISPLAY,FOG LAMPS,BRAKE ASSIST AND MANY MORE OPTIONS! 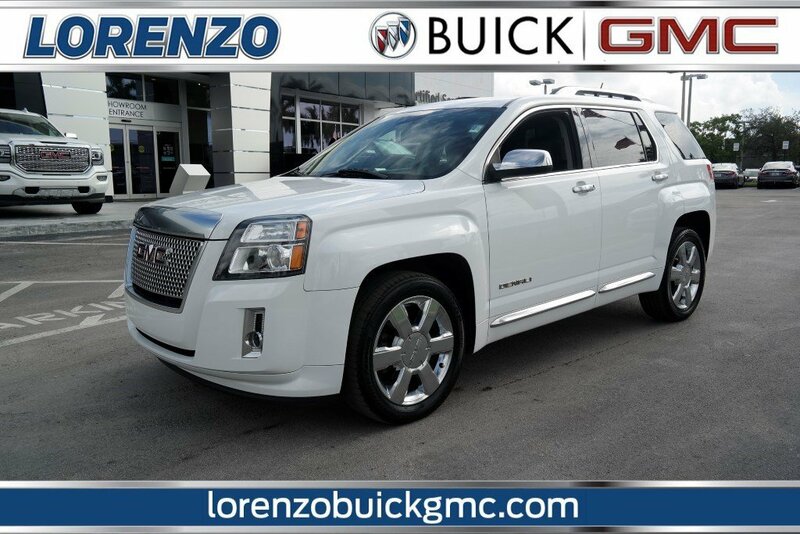 Summit White 2015 GMC Terrain Denali FWD 6-Speed Automatic 3.6L V6 DGI DOHC VVT One Owner, Navigation, Leather, Sunroof, Bluetooth, Hands Free, Backup Camera, MP3, 4-Spoke Leather-Wrapped w/Wood Steering Wheel, 4-Wheel Disc Brakes, 8-Way Power Driver Seat Adjuster, 8-Way Power Passenger Seat Adjuster, Auto-dimming Rear-View mirror, Automatic temperature control, Blind Spot Sensor, Brake assist, Compass, Driver vanity mirror, Dual Exhaust w/Premium Tips, Dual front impact airbags, E10 Fuel Capable, Emergency communication system, Exterior Parking Camera Rear, Forward Collision Alert & Lane Departure Warning, Front Center Armrest, Front fog lights, Garage door transmitter, Heated door mirrors, Heated Driver & Front Passenger Seats, Heated front seats, Illuminated entry, Illuminated Front Sill Plates, Intellilink w/Bluetooth, Low tire pressure warning, Memory seat, MP3 decoder, Outside temperature display, Overhead airbag, Passenger door bin, Passenger vanity mirror, Pioneer Premium 8-Speaker System, Power door mirrors, Power driver seat, Power moonroof, Power passenger seat, Power Programmable Rear Liftgate, Power Tilt-Sliding Sunroof w/Express Open, Preferred Equipment Group 5SA, Radio data system, Radio: Color Touch AM/FM Stereo w/Navigation, Rear anti-roll bar, Rear Cross-Traffic Alert, Rear Park Assist, Rear Parking Sensors, Rear window wiper, Remote keyless entry, Remote Vehicle Start, Roof rack: rails only, Safety Package, Satin Chrome Door Handles, Satin Chrome Heated Power-Adjustable Mirrors, Satin Chrome Luggage Rails, Satin Chrome Surround Grille, Security system, Side Blind Zone Alert, Single-Zone Automatic Climate Control, SiriusXM Satellite Radio, Speed-sensing steering, Split folding rear seat, Spoiler, Steering wheel mounted audio controls, Telescoping steering wheel, Trip computer, Universal Home Remote.Recent Arrival!Awards:* 2015 IIHS Top Safety Pick * 2015 KBB.com Brand Image AwardsReviews:* The GMC Terrain's 'tweener size and unique styling definitely appeal to those who want something styled like a truck, but without truck-like handling. The available V6 engine also gives the Terrain surprisingly good towing capacity for its class - 3,500 pounds. Source: KBB.com* Premium look inside and out; quiet interior; comfortable highway ride; powerful available V6 engine; spacious and adjustable backseat. 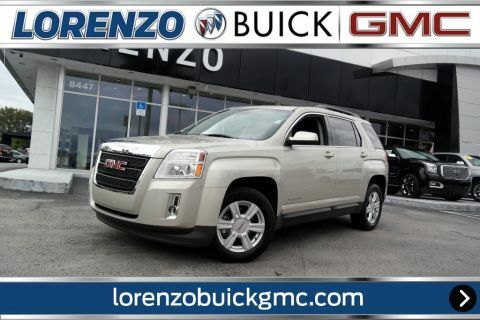 Source: Edmunds* The GMC Terrain is designed to be the perfect combination of luxury and utility and it all starts with distinct, bold design features and striking grille. 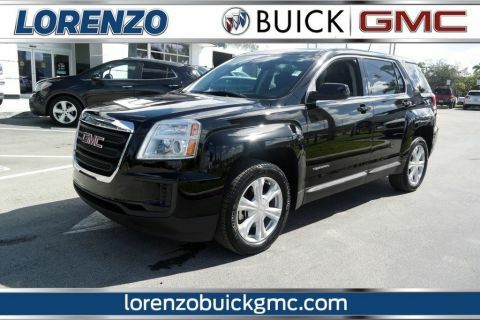 Every Terrain model has standard aluminum wheels to reduce weight and enhance fuel economy. The Terrain's available programmable power liftgate opens to your desired height with the push of a button. Projector beam headlights and fog lamps keep visibility high regardless of weather conditions. The terrain has a refined interior which features a color touch radio and an acoustic design meant to minimize outside noise. 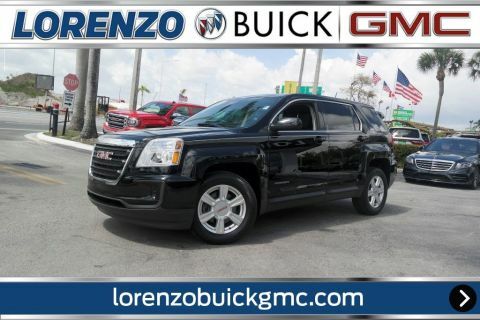 As a crossover, the terrain has the comfort and utility of a small SUV. A 60/40 split and folding second-row maximizes space and there is up to 39.9 inches of rear leg room.